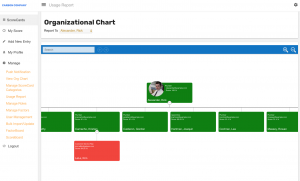 The Org Chart feature displays your company org chart color-coded by performance score for the previous 30 days. To use the Organizational Chart feature first login to your company’s performance scoring application. Once logged in, see the menu on the left side of the screen, click manage and a dropdown menu will appear, select View OrgChart. The default org chart will display the user and all users that report to them. To change the users displayed on the org chart click the “Reports To” dropdown and select a new employee, the organizational chart will then update to reflect the selection. Blue is a non-scored user, green is a high performing user, yellow is a medium performing user and red is a low performing user. Selecting the users name will take you to the FactorBoard to see the entries submitted for the user. Selecting the user’s score will take you to their Performance Score, displaying their score for each ScoreCard Category. For additional support please contact your Account Manager or email support@performancescoring.com.